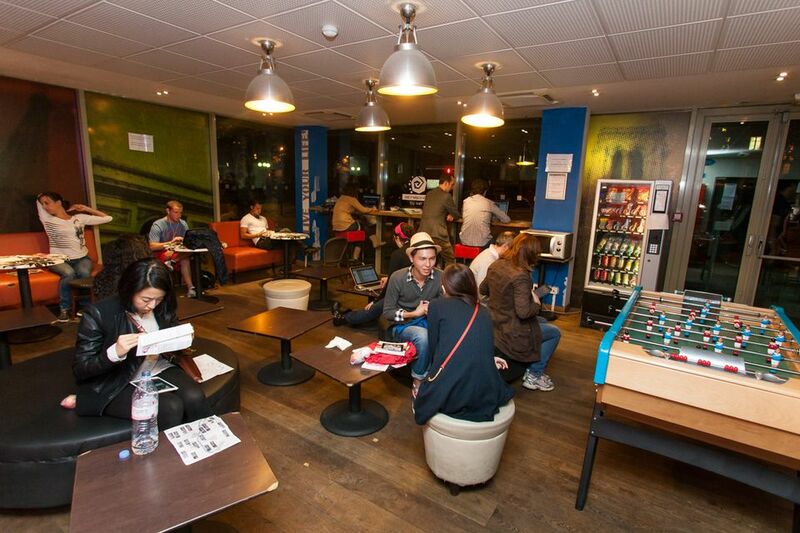 Paris has scores of hostels aimed primarily at students and other young travelers, but not all of these are clean and friendly on top of being cheap. Some even verge on dodgy, to borrow a favorite British term meaning "a little shady". Before your next trip, consult our list of the city's best hostels to ensure your sojourn is a safe and pleasant one. Check out our complete guide to where to stay in Paris for tons of helpful info and advice on choosing the best spots in the city for a short or long sojourn. TripSavvy has another useful and well-informed article on hostels and cheap accommodations in the French capital. This recently built Paris hostel, located on the picturesque yet edgy Bassin de la Villette in one of Paris' off-the-beaten-track neighborhoods, has gotten rave reviews from travelers on TripAdvisor and elsewhere for its friendly service, brand-new, clean rooms and entertaining atmosphere. It's a bit out of the way from central Paris, but I recommend it if you're looking for a more authentic sojourn in the city of light. FYI: There's a second location from the same owners in the less picturesque Gare du Nord district. This is a good choice if you've come on a late Eurostar train from London or from elsewhere in Europe, as the hostel's nearby! Nestled in the heart of the historic Montmartre district in the heights of the city, Le Village Hostel has been postively reviewed by lodgers for its affable and helpful staff members, cleanliness and proximity to some of Paris' top attractions, including the Sacre Coeur and the Moulin Rouge. The hostel's rustic decoration is a nod to Montmartre's artistic golden age. Art and culture fans will appreciate this hostel. This hostel has earned a solid reputation for its central location-- in close reach of most major tourist attractions and ideally situated between the lively Oberkampf and Bastille nightlife districts. This is a popular hostel among travelers, judging from recent reviews, although some have complained about overly stringent room use rules. This is probably not the best choice if you're looking for a party atmosphere at the hostel itself, but it's a good value given the 1-2 person rooms and private showers. Opened in 2007, this relative newcomer to the Paris hostel scene has been praised for its colorful, quirky design, clean and spacious rooms and overall value. It's located near the southern tip of Paris, close to lesser-known neighborhoods including the Butte aux Cailles and one of Paris' lively Chinatowns. Courtesy of the Vintage Hostel. This hostel, situated in Paris' ultra-urban Gare du Nord district in the northeast of the city, has received mixed reviews from travelers, but the overall rating is positive. Travelers have commended warm service from staff, overall friendly and laid-back atmosphere in the common rooms, and quality breakfast, while others have complained of small rooms, noise and unmade beds. The area is safe but on the gritty side-- if you want to stay in postcard Paris, I suggest you book elsewhere. Free wifi (lobby only), air-conditioning, bathrooms in every room, luggage storage. Claiming to be the first independent hostel to open in Paris two decades ago, the Young and Happy Hostel is situated in the smack center of one of the city's most touristy districts, on the famed Rue Mouffetard in the Latin Quarter. The hostel has been recommended for its friendly staff, ideal location and good value for money. Travelers who like shopping for fresh food will appreciate the open-air markets on the same street, renowned for their quality. This is a good choice if you want to see Paris in an idyllic, postcard friendly light. The consummate Parisian party hostel (as the name would suggest), the Peace & Love Hostel is not for everyone, and it shows in the highly divided reviews found on TripAdvisor and elsewhere. The hostel appears to inspire a love-or-hate feeling. Travelers looking to land friends or love interests and stay up into the night will appreciate this laid-back hostel, situated off the lively Saint-Martin Canal. If you have a low tolerance for noise and want a squeaky-clean experience, however, I'd choose somewhere quieter and a bit more conservative, such as the Young & Happy Hostel (see previous slide). Courtesy of Woodstock Hostel Paris. Located just a stone's throw from Montmartre and within reasonable walking distance of central Paris, the Woodstock Hostel has gotten positive reviews for its low rates, helpful staff and opportunities to make social contacts with other travelers. Its psychedelic-hippie design themes will please some, and inspire gentle eye rolls in others. However, scattered reports of uncleanliness and surly staff members make me think it might be best to reserve this one as a backup option. This hostel enforces a 2:00 am curfew. Free breakfast, internet access, kitchen access, luggage storage, bar open until 2:00 am. Claiming to be the "friendliest hostel in town", the Aloha hostel opened in 1989-- making it one of the oldest independent hostels in Paris. It's in a sleepy, relatively unknown part of southwest Paris, but within close reach of attractions including the Eiffel Tower. Travelers have given overall mediocre ratings to this hostel, making it a backup choice rather than a first one, in an ideal situation. Courtesy of Caulaincourt Square hostel. Located in a particularly picturesque and residential corner of Montmartre beloved by foodies for its bakeries and nearby markets, this hostel recently underwent a redesign. It's an especially good choice for young couples and friends traveling together looking for no-frills accommodations, because the Caulaincourt Square has several private rooms available. For still more ideas on where to lay your head in Paris, I recommend checking out this site which is a network of hostels trusted by travelers.